GB: For those visitors who are unfamiliar with Beyond Divinity, can you give us a brief summary of the upcoming RPG and how it relates to the original Divine Divinity? David: Beyond Divinity formerly known as (Riftrunner) - is the widely anticipated follow up to Divine Divinity, our first computer role-playing game. After its launch in 2002, Divine Divinity has been receiving awards and accolades worldwide. Divine Divinity took players on a fantastic quest in a land torn apart by corruption and dark magic. By combining the best features of the RPG genre, and introducing a host of new features, Divine Divinity appealed to both hard-core and new RPG players. That's why we have now expanded the Divinity universe and created Beyond Divinity, a new breathtaking journey that will delight fans of the original while appealing to new audiences at the same time. GB: Where do you currently stand in the game's development process? 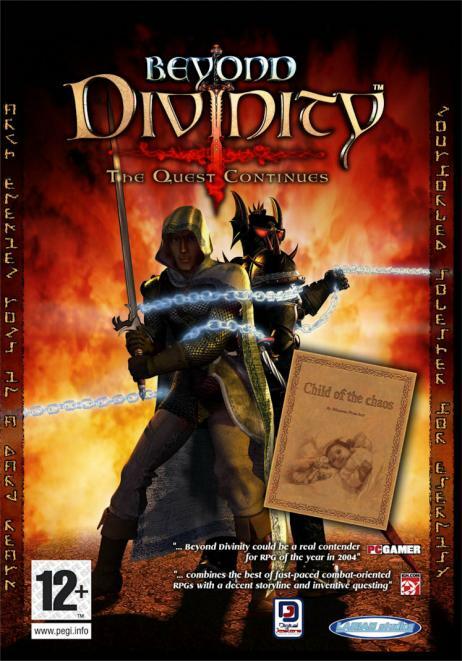 David: The street date for the English version of Beyond Divinity is scheduled for late April 2004. We recently released the demo, which has been made available on the internet and through several magazines. We are now taking into account the comments and advice we have been receiving from the public. We added some functionalities since, and recently even started re-recording some voices. By employing the services of high quality improvisation actors in Toronto, any doubts that fans might have had about the voice recordings in Beyond Divinity should soon be history. GB: Can you explain the character development process in Beyond Divinity, and what changes and advancements you've made over the original Divinity title? David: The character development has improved a lot. There are two new attributes, so now you have strength, agility, constitution, intelligence, survival and speed. You get a certain amount of points to distribute over these stats yourself, or you can choose a recommended setting. You still get to choose between Wizard, Warrior and Ranger. Another thing you'll have to do, is choose your initial skills. This unlocks your starting skills, so in other words, you can still develop your character in any way you want, as you will unlock more paths during the game by learning them from a book or a teacher. He learned the art of converting normal arrows into multiple elemental arrows. He also learned how to recover his arrows once he shot them. He cannot recover all arrows however, so he studied how to smoothtalk merchants to give him more arrows for less gold. Shooting at point blank does not frighten him, and he has studied ways of how to successfully increase the damage an arrow does. As you can see, he relies on his bow, so he even learned how to repair it himself. Although he's not a coward, and though he's very skilled and accurate with a bow, he still studied a basic "Hold" spell to stop an enemy in its tracks, so he can enjoy shooting sitting ducks once in a while. As some enemies are resistant to elemental damage, he was taught how to make traps that contain potent curses that decrease these elemental resistances. To get out of the way of melee combat, he can try to discourage creatures. He often meets with creatures that are headstrong, or plain dumb, so he took some acting lessons, and sometimes feigns his death. Because he realized you can't do everything yourself, he successfully located summoning dolls, and boosted one of them to do the dirty, close-up and personal work for him. After all, when the summoned creature dies, it can be summoned again after a certain amount of time. He made another one of his dolls very resistant to all kinds of damage and taught it how to lure enemies away. Using this particular doll as bait, he can lure enemies into traps, or simply as far away from him as possible. I could continue for quite some time, but I guess it's clear by now that there's room for quite some strategy in your character development. GB: Tell us about some of the more exciting environments players will adventure through in the game and any obstacles you've run into creating them. David: The main part of the game will be played in completely new areas that cannot be compared to the areas in Divine Divinity. You should read the story behind Beyond Divinity, and you'll find out what a strange, outworldly realm we've had to create, with lava rivers, mushroom forests, crystal islands... You will still visit parts of the world you know from Divinity, but to know how and why, you'll have to play the game. I can tell you however that it will be nice to see what has happened to Rivellon over the years. We did not really run into any obstacles when creating the environments. It was something different, and we like challenges. The main challenge was to create a dark, yet still colourful atmosphere that was not too gloomy.